Basically, in any websites development, one always hears the call to “make it big”. But here is another part of website designers that have challenged themselves and each other to “make it small”. Sounds strange? Well, checkout the sites below. Guimp claims to be the world’s smallest website, but absolutely real with news, search, games, shop, links and many others, even a blog. It is an incredible site. GUIMP was first began to release as the smallest website in the world, as the 18×18 pixel versions of some old favourite arcade games such as break out, pacman and football. The games are, other than you do give with a bit of eye strain after a few minutes of trying to keep away from 1 pixel ghosts. But then, a website known as Dot 16 decided to take the designer of GUIMP on with only a 16×16 pixel compared to GUIMP as competitor. 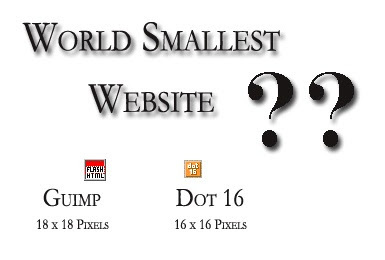 Despite the fact that Dot 16 does succeed in take the crown for smallest website, it may seem a little silly to be quibbling over an extra 2 pixels on each side of the square. Users will be amazed at how much easier it makes navigability and game play. So, is there no limit of visual perception in Graphical User Interface (GUI) environments for human? These surely are the way to go creative for both developers. You are forgetting the ultamate in small, the one pixel website!